I am so excited to share this week’s post with you. This week I am sharing some ATC’s (Artist Trading Cards) I made for the Back to Back 2019 Retreat I went to. If you don’t know what ATC’s are, They are 2 1/2″ x 3 1/2″ cards that artists make to share with each other. Sometimes there is a theme, but for this retreat it could be anything. I had just received a package of the fabulous Tim Holtz Idea-ology Transparent Wings and knew right away I wanted to make some fairy themed cards. I tend to hoard my Tim Holtz paper dolls, I just love vintage photos. Artist Trading Cards are such a handy way to use up some of the smaller “dolls” that come in the package. Now I had a lot of steps in this project so the best way to see them all will be to watch my video. I will break down a little below what I did so you get the general idea. I started with a large 11″ x 15″ piece of heavy weight watercolor paper. I then used my Tim Holtz Matte Collage Medium to glue on some pieces of happy mail scrapbook paper bits to add some dimension and texture to the background. Here I made a mistake though, I knew I wanted to use the Distress Spray Stains but not having used them before I forgot that they need a porous surface. You will see in the video that as I added water the sprays just washed off my page. They did stick to some areas that hadn’t gotten the medium on them but overall it wasn’t my ideal result. I then improvised. I got out my Dylusions paints and did some splattering on the background in pink, blue, green and orange. The main thing to keep in mind when you are making a large background for a large stash of ATC’s is that what you see is not what you will get. Once the paper is all cut up you will have lots of unique backgrounds that end up looking really net compared to the “mess” the original page is. The one large sheet of paper yielded eighteen (18) cards for me. What I did was I poured out my Paper dolls onto my desktop and just started grabbing a paper doll and a background and I did this for about an hour (not on video) until I felt I had matched up all the people I liked to an appropriate background. I then worked the cards one at a time. I would add the paper doll and then add some accents. I used washi tape on some, a stabilo all pencil on others to add some texture, I added stamping where needed for background. I also added the Tim Holtz Idea-ology Transparent Wings. All the cards I edged with a color of Distress Archival Ink and finished with a quote from the Tim Holtz Small Talk booklet. I hope you are as excited as I was for these little fairy ATC’s. I think they were a great way to bring in some Spring to the season and use up some of those bits in my studio I’ve been holding on to. 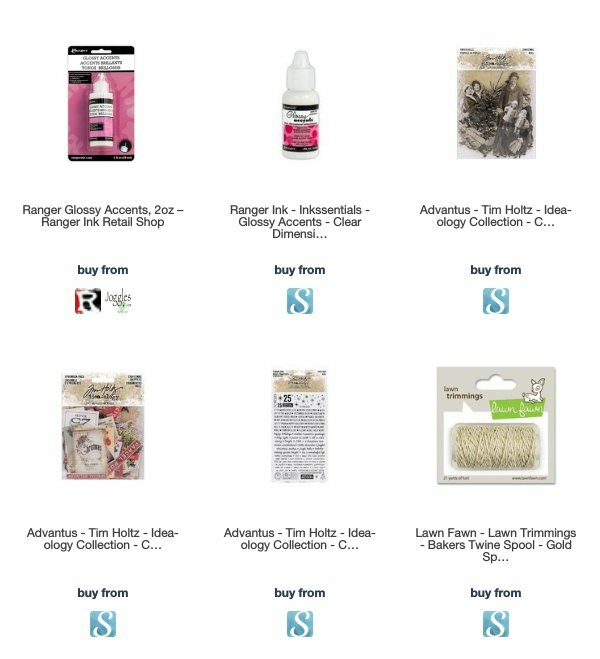 Below you can find all the products I used thru my affiliate links with scrapbook.com, ranger.com, joggles.com, blitsy.com and blick art supplies. Be sure to grab your Tim Holtz Transparent Wings while you can. They are a hot item this season.